The UK farming community have been severely affected by Bovine TB with badgers believed to play a part in its spread. A large area of the South Downs between Brighton and Eastbourne is a bovine TB High Risk Area. It is possible that the government could sanction culling of badgers here in an effort to control the disease. However the Sussex Wildlife Trust is opposed to the programme of culling promoted by the current government. With Sussex Wildlife Trust’s own grazing project under threat from this terrible disease we felt it was time to take steps in managing it using a number of measures, including a badger vaccination programme. Our grazing project is a fundamental tool in the management of our nature reserves and has been affected by this disease for a number of years. Thanks to donations provided by the Sussex Badger Appeal we have - in partnership with the volunteer led Sussex Badger Vaccination Group - begun a five year programme of badger vaccinations at both our Malling Down and Southerham nature reserves. These nature reserves on the Lewes Downs are at the centre of our grazing project, where many of our cattle are held and looked after. During last summer, surveys were carried out in order to establish where our badgers live. It was clear that on both nature reserves these animals covered a lot of ground foraging far and wide. This gave us hope that what we are doing will also benefit our neighbours and help reduce the risk of bovine TB across the wider landscape. 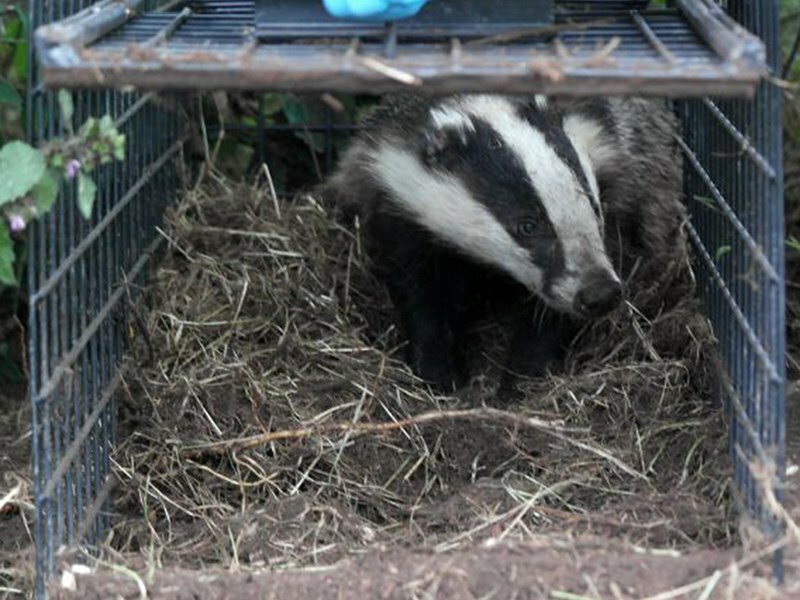 Once the vaccinating process began traps were put out on establish badger routes near to their setts. Tasty snacks were used to entice the badgers into the traps, which proved very popular. Once the badgers were happy going in and out of the traps a trained team from the Sussex Badger Vaccination Group began the vaccination process. Very carefully the trapped animals were marked and then injected with the live vaccine. It was clear that the badgers quickly forgot this experience as the same ones kept returning to eat more of the tasty treats, trapping themselves again! Good job the vaccinated badgers were clearly marked. This programme will now continue for a further four years. Once complete we hope to see a marked reduction in bovine TB on our two nature reserves and our neighbours land on the Lewes Downs. How else are we managing for bovine TB? As mentioned this is a disease we have to manage and deal with as we graze sites all over Sussex from Midhurst to Rye Harbour, transporting cattle and sheep to where they are needed. To avoid unnecessary journeys for our cattle we operate local grazing zones within Sussex where animals will remain all year. We have also implemented a more rigorous TB testing regime than is currently requested by DEFRA. This sounds an excellent programme, but will you be able to get the vaccine? I understand there is a severe shortage at present. Defra’s preferred option is culling. By controlling the availability of vaccine they can claim that the Wildlife Trusts’ programmes are not working and the only alternative is to kill. Apologies if this is an ill-informed question, but is the vaccine still available on the Continent, where vaccination of badgers is common? If it is, could we buy some from there? I would like to know whether there is a correlation between the huge increases in the badger population that have occurred over recent decades and the decline in hedgehogs. While badgers are beautiful creatures, I do think there is a case for control, as unlike hedgehogs, they have no natural predators. Hi Celia, thank you for your question. Badger populations have increased over the last 30 years and there is some concern that this is the cause of the hedgehog decline. It is true that hedgehogs are preyed upon by badgers and that badgers will compete with hedgehogs for food, however the People’s Trust for Endangered Species and the British Hedgehog Preservation Society have found no evidence that badgers are an important factor affecting hedgehogs. Hedgehogs are declining just as severely in urban areas, where they rarely encounter badgers, as they are in the wider countryside. Also in areas where there are low badger numbers, such as East Anglia, hedgehogs are declining as much as in areas with lots of badgers. Whilst it is true that hedgehogs will avoid areas with high numbers of badgers, it is the lack of suitable habitat and availability of insect food that is having the biggest affect. Bigger, better and more joined up hedgehog-friendly habitat is the best way to help them. I do not believe vaccination or culling of badgers is the answer. The cost to the nation in removing infected cattle is enormous. Other animals come into the equation ie deer whose numbers like badger’s are increasing and some herds are infected. One answer is vaccination of cattle but we have to wait for one to be developed. In the meantime possible total removal of badgers in some areas may be worth trying and selective culling of deer that cause damage to crops and in woodland.